When a musician makes the tough decision to step away from their band, most of them usually either head in a different musical direction, get an industry type job, or disappear altogether. Jim Lindberg wasn't content with any of those options. After 20 years and nine albums fronting Pennywise, Jim decided it was time for a change and started up a new band, The Black Pacific. Instead of switching genres or mellowing out, Jim focused all of his attitude, passion, and aggression into what he does well, making great punk rock music. With a new band and a new outlook, Jim was free to experiment and create without any of the constraints or limitations that come along with being in a band for two decades. But make no mistake about it, behind every new guitar effect or sonic texture, there is beautifully brutal music pounding it's way into your head and heart. Jim handles all of the vocal and guitar duties in The Black Pacific, with Davey Latter on bass and Alan Vega on drums rounding out the trio. Anyone familiar with Jim's songwriting style will find much to relate to in these new songs. The search for something to believe in ("Time Is Not The Reason," "Kill Your Idols" and "No Purpose"), the way people hurt each other ("Almost Rising" and "Put Down Your Weapons"), the meaninglessness in the pursuit of "the American dream" ("The System" and "Living With Ghosts"), and materialism ("Defamer") are just a few of the issues that get a simple, yet nonetheless important, lyrical spotlight. The heavy themes are emphasized by an even heavier musical backdrop. Not sloppy and sludgy heavy though. I'm talking tight, powerful guitar, thundering bass and hammering drums that boom and crash in all the right places. While Lindbergh wrote all of the songs beforehand, he acknowledges that it became a collaborative effort with his band mates in the studio and he credits producer Shaun Lopez (guitarist in Far) with helping him get the right tones and sounds for these songs to live in. The result is an album that will make you feel less like settling for things and more like getting up and doing something, anything, to keep things from staying "as is" when change is needed. The Black Pacific was birthed from, and is a call to, action. 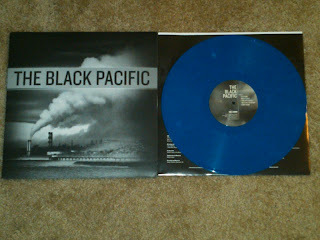 So forget just dipping a toe, dive headfirst into The Black Pacific, the water's fine. 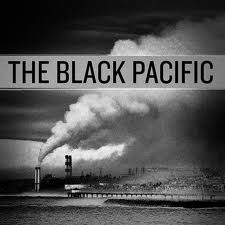 The Black Pacific will be released on Side One Dummy Records September 14th and orders for the limited color vinyl can be placed here. Side One Dummy always puts out killer vinyl colors and this one is no exception. Pressed onto a brilliant blue vinyl with just a hint of white marble, the album evokes the idea of an ocean with a few cresting waves or a sky with just a hint of clouds. Either that or my inner hippie took over and it's just a really cool color combination. Either way, it looks great and sounds even better. As always, kudos to the Side One gang for knocking it out of the park again!